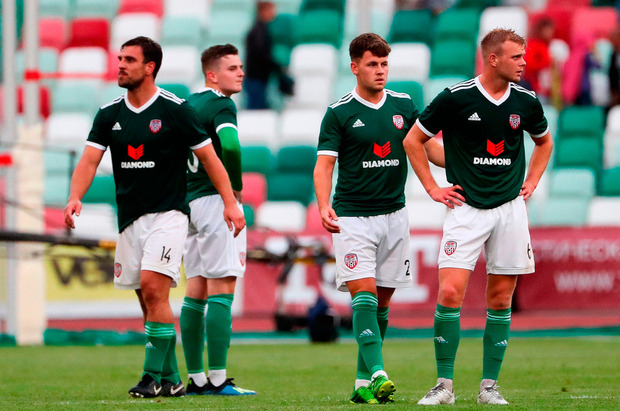 Goals from Ally Roy and Ronan Hale saw Derry City claim a famous European win in Belarus, but Dinamo Minsk survived the scare to advance. Derry went ahead after seven minutes with Aaron McEneff playing Ally in with a superb through ball and the Scot showed great composure as he placed the ball past Sergey Ignatovich. The Candystripes almost grabbed a second on 15 minutes, Roy forcing Ignatovich into a fine save at his near post. From the resulting corner, an unmarked Darren Cole got his head to a McEneff cross only for Ignatovich to save again. Then the hosts equalised with their first effort on target on 27 minutes to regain control of the tie. Anton Saroka's free kick caused havoc in the Derry area and the ball fell for Aleksandr Sachivko, who swept home from close range. However, the visitors again stunned the Minsk crowd in the second half by retaking the lead with 15 minutes remaining. Aaron Splaine's ball put Roy into the Minsk area and he showed great composure to wait for the run of Hale and play him through while Hale did the rest, firing into the bottom corner. Derry were almost caught on the counter as they looked for a third when Minsk broke and Nikolic went for goal but Gerard Doherty pushed it wide for a corner. Khvaschinski came close in added time when he was sent clear and rounded Doherty but Darren Cole came to Derry's rescue by clearing the ball off the line.